Continuing to out sci-fi cable’s Syfy channel, the resurgent CW network launches another solid, otherworldly entry with The Messengers. in his mid-60s, Pedowitz at the time seemed a puzzling choice to head a network that aims its programming directly at 18-to-34-year-olds. Instead he’s turned out to be a wizened Yoda whose long tenure at ABC has given CW the experienced leadership it didn’t know it needed. The Messengers, premiering Friday, is more far-flung than most CW hours. In the opening minutes it bounces from Socorro, New Mexico to Jaurez, Mexico to Tucson, AZ, to Houston, TX to Little Rock, AK. Denizens in each of those venues are affected by some sort of shock wave emanating from a mysterious object that crash-lands in Socorro and leaves a crater the size of New Orleans’ Superdome. 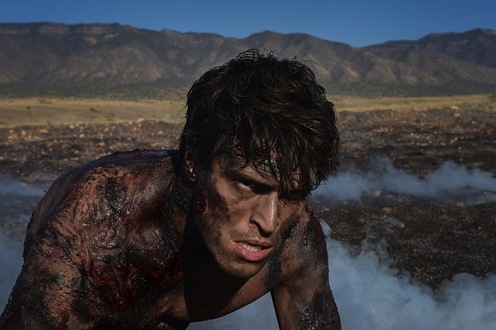 Emerging from the charred remains is “The Man” (Diogo Morgado), a contemporary Lucifer bent on wreaking basic havoc in the form of death and destruction. It’s quite a turnaround for Morgado, who played Jesus in History channel’s The Bible and its big-screen spinoff, Son of God. Guess he didn’t want to be typecast. The pseudo X-Men of The Messengers emerge from their shock wave doses with new-found attributes ranging from super-strength to mind-reading to healing power. This makes them “Angels of the Apocalypse” versus The Man in a battle to thwart The Rapture. The others in Joshua’s shoes are National Deep Space Agency researcher Vera Buckley (Shantel VanSanten); bullied high school swimmer Pete Moore (Joel Courtney); young, formerly drug-addicted mom Erin Calder (Sofia Black-D’Elia) and undercover drug agent Raul Garcia (JD Pardo). All share the same first response to the shock wave. Their pupils dilate and they collapse. Viewers also will see something that Vera, Pete, Erin, Raul and Joshua don’t. They briefly sprout angels’ wings that last for a few second before vaporizing. So far there are no devil’s horns for “The Man,” who first appears to Vera and says of her missing son, “I know who took him. I know why.” But first she must finish a job for him. It’s always something. It all plays out in reasonably “believable” fashion during an effective scene-setting pilot episode. The Messengers seems to have its sci-fi basics in order. Present an appealing batch of young, disparate characters. Invest them with a range of powers and then unite them against a common and very formidable foe determined to inflict mass chaos. We’ve been here before, but no matter, really. The trick is in the execution. And The Messengers looks as though it has a handle on how to pull this off with some flair and identity of its own.